Visibly reduces the appearance of fine lines & wrinkles. With age, the skin's ability to produce energy within its cells is reduced. As a result the skin's defence is not as effective, new wrinkles appear and existing wrinkles deepen. 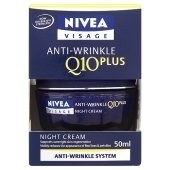 After years of research, Nivea presents its best Q10 plus Anti-Wrinkle System ever! 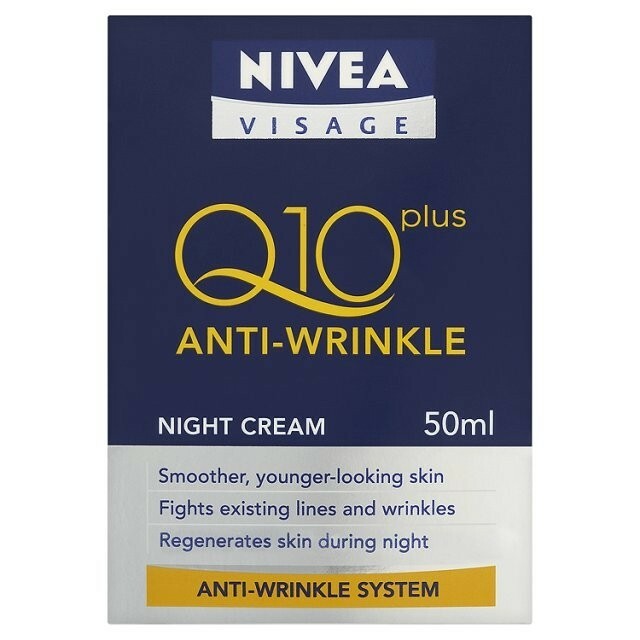 Nivea Visage® Anti-Wrinkle Q10 plus Night Cream now contains 100% more Coenzyme Q10. With double the strength of Q10, it supports the skin's energy metabolism from within to continuously fight wrinkles. The intensively moisturising formula replenishes and regenerates the skin at night, when it is most receptive to moisture intake. The outcome: the skin is effectively relieved from daily stress and feels soft & supple in the morning. Use daily after cleansing with Nivea Visage cleansing products. Apply the cream by gently massaging into the skin using small upward circular strokes, avoiding the eye area.